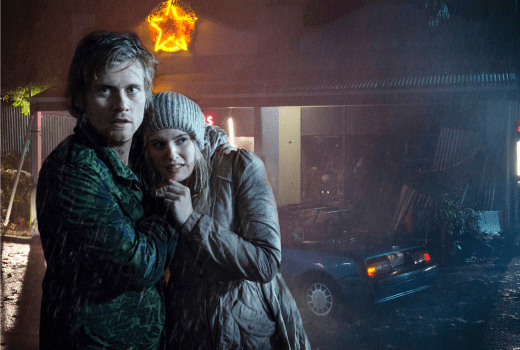 a tornado is set to hit Ramsay Street (Sharknado you have a lot to answer for). Presumably not everyone is going to make it out alive when the storm hits at the end of the month. Check out this campy promo clip. With its Noah’s Ark 2 x 2 hints, it looks like we will be in for two of everything this year. @ Vinny, the boat symbolises Noah’s Ark, you don’t have to take a promo so literally you know, the boat is just used to illustrate the theme for this season. So I guess the actual “kerb damage” will be minimal. seeing as it’s its a real residential street. maybe a few gnomes will get knocked out? maybe a few leaves blown on to the road. I am guessing most of the damage will be at Lassisters or in the “backyards”. Yes Neighbours has had some wonderful character driven stories over the past couple of years, which in soap opera terms is way better than H&As plot driven storys. treeman – They have had older people on BB before but they end up getting voted off in the first or second week. What a stupid promo for BB. So this years show will be on a ship wtf…..
Neighbours is a pretty good show nowadays, much better than H&A, mainly because they play to they’re strengths – which is not big budget storylines because they don’t have the money. They don’t ever leave their back lot any more. Interested to see how they pull this off. Well there have been mini-tornadoes in Melbourne’s suburbs in the past (and recent present), hitting suburbs like Blackburn, Nunawading, Croydon, Yarraville and Chelsea, there was one in Keysborough in June this year (also been some bigger ones in Ararat, Ballarat, Rutherglen and Bendigo). They have taken down trees, ripped roofs off houses, wrecked cars, injured people and etc., so if Neighbours sticks to that premise it is not far fetched at all. I too thought that a tornado in Melbourne was quite far fetched. They have indicated that Erinsbourough was a suburb of Melbourne, even though for quite a few years initially it was never clear. Having said that, the ramsay St residents are always in light clothes, during the winter time, which is also not typical of Melbourne. Just checking out that BB clip if they are the actual housemates none of them look particularly older than 30+ so much for looker for all generations! What a terrible show! The writers must be desperate. Desperate Housewives tornado was also a bad idea. Climate change is even worse than we thought! Tornadoes in the suburbs of Melbourne! This will be interesting and fun to see. I don’t think they’ll have the aftermath scenes like Desperate Housewives did when Wisteria Lane was unrecognisable with all the stuff they brought into make it realistic. I’m really hoping they bring out some new house sets after the tornado, most of them are now half their original size for no apparent reason, and really need a makeover. I haven’t seen anything on who is scheduled to leave the series, so I’m guessing that any character who may die will be a guest character. A new permanent character arrives this week, Nate Kinski (a cousin of Rachel and Zeke). So this might mean the opening credits get a refresh, finally showing all the new cast and removing some former. I don’t know of anyone leaving neighbours so not sure that someone will die. And it’s about time they have a disaster like this as they haven’t had one in years. Good idea I rekon. Here in Perth we get them every year and recently one went down a street and tore about 15 houses up along the street.